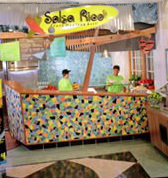 Salsa Rico Fresh Mexican Grill franchise business opportunity. 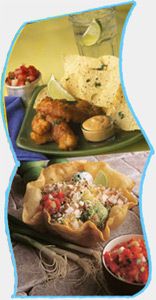 Free Salsa Rico Baja Mexican Food business franchise information. On the coast of <?xml:namespace prefix = st1 ns = "urn:schemas-microsoft-com:office:smarttags" />Baja California the Pacific breezes are balmy and life is just as easy as you've heard. Just fresh, clear flavors served in a relaxed atmosphere. Salsa Rico salutes that fresh and honest way of life. We make our salsa daily and you can taste the pure goodness that comes only from the freshest ingredients. So kick back and enjoy! Salsa Rico is a Wave of Freshness! experience of the Pacific. With flexible build-outs including stand-alone and in-line versions, Salsa Rico is perfect for both single and multi-site development! At Salsa Rico, you work with a certified trainer from start to finish! With one week of hands-on training for each position and two days of classroom instruction focusing on guest service, marketing and financial management, it's easy to see how we make it simple for you to learn the standards and support Salsa Rico offers. Each Salsa Rico will receive a minimum of 8-10 promotions per year that include, recipes, procedures, POS, banners and miscellaneous merchandising materials. A la carte merchandising options are also available. As a subsidiary of global food service provider Sodexho, the Retail Brand Group offers a portfolio of eight distinctive brands for you to choose from. The experience of over 400 locations nationwide shows the success the Retail Brand Group has had at pleasing customers across the country! To learn more about the Salsa Rico Baja Mexican Food franchise opportunity, simply complete the form below.